pic by Jonx Pillemer. More here. The brainchild of Rangoato Hlasane and Malose Malahlela from Keleketla! 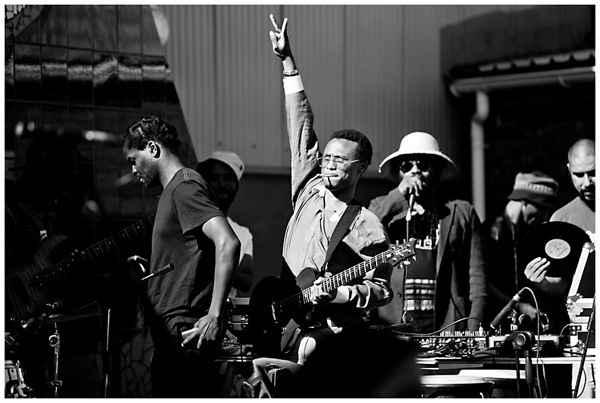 Library, the Okestra invites a crew of young independent Joburg-based musicians (supported by the Goethe Institut) to investigate the meaning and importance of kwaito music’s legacy for a new generation. More here. Their PASS performance featured original and new members of the okestra, including Card on Spokes (electronics), Lee Thomson (trumpet) and Masello Motana (vocals), and was arranged, directed and conducted by Cape Town jazz pianist Bokani Dyer. The set is followed by Mogale’s after-party set. Category: Pass Blog, Pass Radio | Tags: Thath’i Cover Okestra | Bookmark: permalink.